What are you going to be for Halloween Twitter? camera (Twitter) Twitter names have been dressed up for Halloween. Dressing up for Halloween is never easy. You've go to decide what -- or who -- you want to be, go shopping to find the right pieces to perfect your costume and then put them all together. You know what's a lot easier? Twitter's version of Halloween. 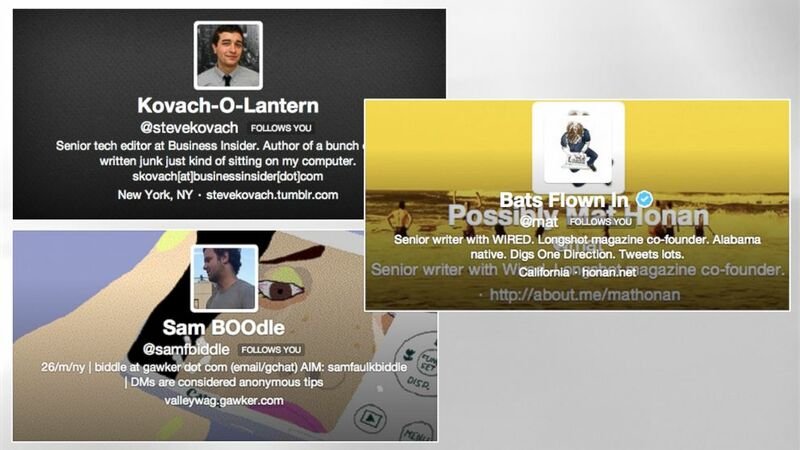 Over the past week or two, excited Twitter users have tweaked their names on Twitter to Halloween-spirited titles. Just add a "boo" or a "bat" or a "lantern" to your name, and you're ready to tweet or treat. There's @mat or Mat Honan who is now Bats Flown In. There's @stevekovach or Steve Kovach who is now Kovach-O-Lantern. There's @sambiddle or Sam Biddle who is now Sam BOOdle. There's @missambear, now AmBOO. And then there's the very clever @johnjcook who is now John Halloween. You don't have to change your actual handle, only your display name. You can do this on Twitter by navigating to the Settings section. Under the Profile tab you'll see the "Name" field. Twitter says, "Enter your real name, so people you know can recognize you," but it's clear Twitter is bending the rules for some good Oct. 31 fun. And no, this isn't an official Twitter sanctioned practice. It's just some viral holiday fun believed to have begun with some gaming and tech journalists just messing around. But as the Atlantic Wire points out, picking out a spooky Twitter handle can be just as difficult as picking out a Halloween costume. So what are you going to be for Twitter Halloween? Let us know in the comments or, you know, on Twitter at @TechThisOutABC.